Windproof and hardy campers who like plane spotting and sunbathing when not trackside. The shortest stagger home after the Beermountain AMM on a public site. None, other than its exposure means it is exposed to occasional high winds. BIG AND OPEN SO MAKE YOUR OWN.. This is one of the big sites and tickets are normally fairly easy to get. It has allocated pitches on relatively flat grass. It has a very open, and some would say exposed feel. 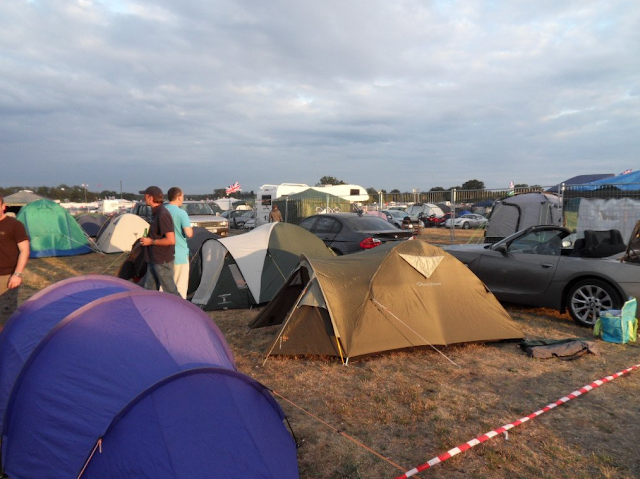 There is a single large temporary shower and toilet block towards the centre of the site, which also contains some private camping which is fenced off. 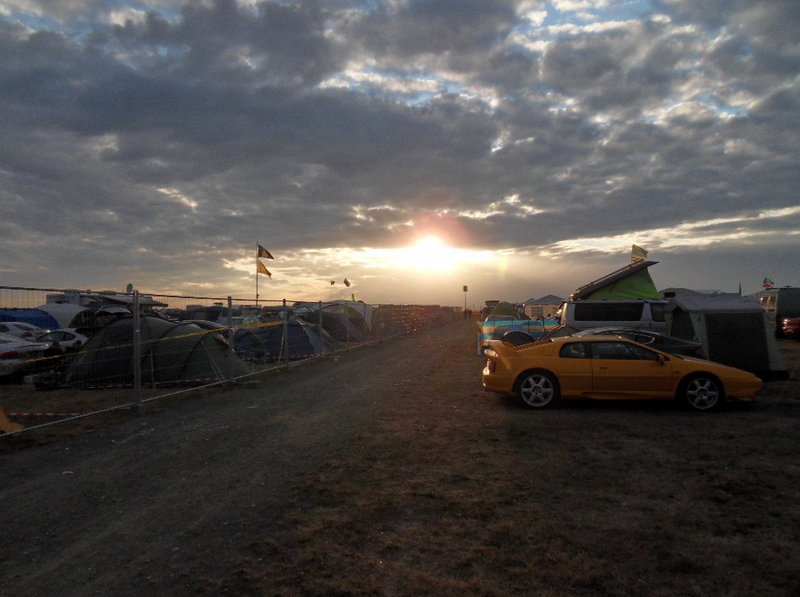 The open nature of the site means campers are exposed to winds. On very hot days sometimes these local whirlwinds cause damage to things like gazebos and awnings. 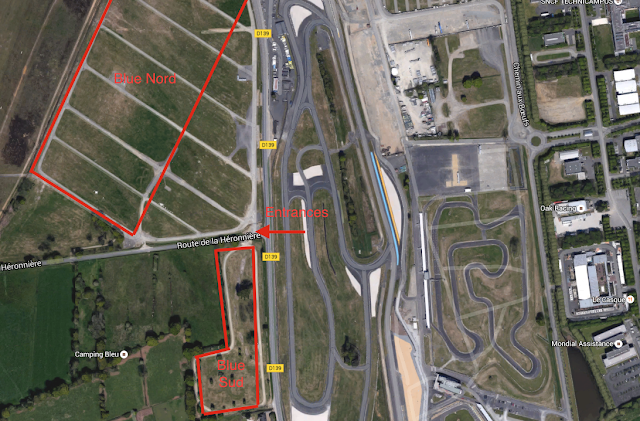 Other than the airport runway, nothing is very close, but there is a great shortcut through to Arnage and the huge Super U by travelling on the small lane sandwiched between Blue Sud and Blue Nord. During WW2 Le Mans airfield was home to Luftwaffe units mainly flying ME 109's. The modern airport is operates mainly with private flights and charters. Team GearsnBeers stayed on Bleu Nord for second year running in 2015. Pitched not far away from Brians compound, easy for AGM stagger, 6 cars on adjoining allocated pitches, enough room for all cars 6 decent sized tents and a gazebo. Facilities, as in loos and showers, were cleaned regular although the queues at rush hour were a bit long, but all the same presentable. Atmosphere is good, there were all sorts of groups, some with loud music and generators, others in 1 van and 2 people, to the extreme of a troop of scouts, with Beermountaineers scattered in between. No troubles to be had, only 5 minute walk to entrance in to the circuit and then on to start finish straight, good for Saturday Night viewing, and about 15 min walk to Jannines. good vantage point from the front of the site for mad Friday, would suggest staying away from the pitches near the gravel track on to site as this becomes very dusty, weather permitting, with all traffic in and out. On the whole a good site I give it 4 bottles. Bleu Nord is a relaxed camp site, with good facilities. Porsche Curves in about a quater of an hour, The Village and the tram station are a bit of a hike, but what is Le Mans without the odd route march? Good facilities with numbered pitches, sufficent toilet blocks, and showers, Murviless crew tip, use the individual plastic cabins rather than the potacabin blocks, the hot water supply is better. The toilets were kept well cleaned and stocked throughout the weekend, they never even ran out of paper! Security was good over the race week, but of course the usual pikeys started to mop up what they could from late Sunday night onwards, so as always be careful and aware.